Can't Stay Saturday to Saturday. No Problem! Pick Your Days! Free WIFI in Condo!! NEW bed/with memory foam mattress as of (July1, 2018), tile, colors, counter top & tile back splash, crown molding, wainscoting, furniture, HD flat screen Smart TV, privacy French pocket doors, corner breakfast bistro sitting area, new bathroom and more. A beautiful gulf view on one of the best beaches in Florida! You can see Sanibel Island from our balcony! Located on the 5th floor, building A of Estero Beach and Tennis Club, this condominium gives resting place to the perfect getaway. 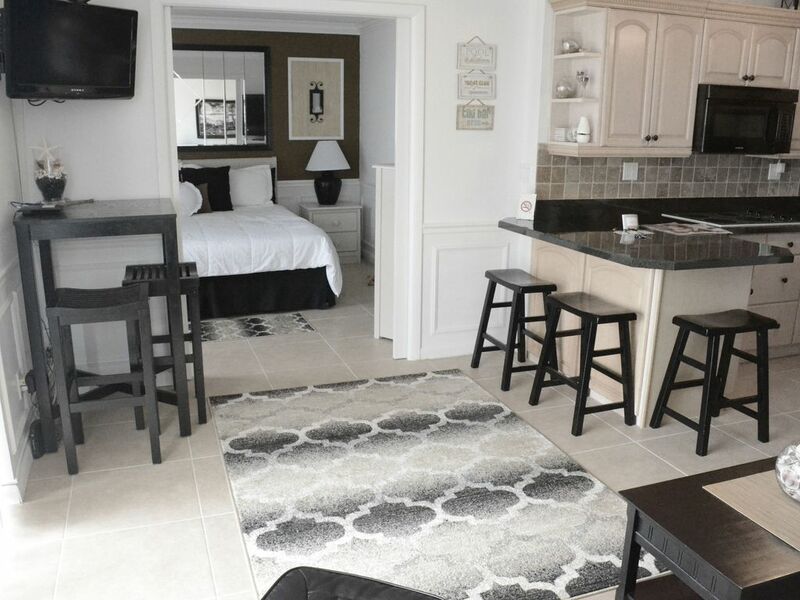 This 'non-cluttered' bright and comfortable condo leaves our visitors with a smile every time they leave! We provide you with an excellent place to relax with all the amenities that will make this an unforgettable vacation. This incredible location gives you access to four clay tennis courts, heated pool, shops and restaurants across the street, and a trolley that will provide you transportation to all additional beach activities or just simply relax in the many sitting areas located around the Beach Club. The seven mile stretch of sandy white beaches will leave you breathless and won't cost you a fortune to enjoy it! I love the beach! I have owned the property for about 15 years now! It is a sanctuary from our very busy world! My husband and I own the two event magazines in southwest Florida. Happenings Arts and Entertainment Magazine and Lee County Family News-Kid Events. We hope you have a wonderful experience! Enjoy our weather! This was my 3rd time coming to fort myers beach and the first for my husband and our son. The condo was absolutely perfect for what we needed. Everything was clean, there were many supplies/appliances for us to use. Just a short walk across to the market where we bought fresh fruit that was AMAZING! Pool area was busy at times but clean and relaxing. Just a very short walk to the beach. If I had to give any constructive criticism I’d suggest maybe having a beach cart available for guests to use (when traveling by flight from Canada we couldn’t bring one with us). Also, maybe having the trolley information brochur available in the condo would be helpful to those that don’t know about it. Kathy was wonderful to deal with she was very quick to respond. We were sad to see that July wasn’t available this year because we would have booked it again! We will definitely be back in the future! I loved it very comfortable. Very nice place, wonderful beach. Within walking distance if you don't want to drive. Owner awesome and quick to respond to messages. I would not have changed a thing other than I would have stayed longer. We spent a week in this unit. It is smaller than what we are use to, but ended up being fine. The furnishings are cute. I didn't quite realize our unit wasn't directly on the ocean, but the side view was amazing! It also was not in direct sunlight, so I spent many hours out there enjoying the cool breezes. The pool was great right when it opened in the morning, it was like stepping into bath water. It gets quite busy during the day, but if you want a peaceful swim go out in the early morning. It was wonderful. The condo is beautifully decorated and very comfortable. Everything we needed for our stay. Kathy is great and very helpful!!! And the bed.....WOW. Will definately be back. This was perfect for our vacation! Quick response from owner when we needed her. Beautifully decorated and stocked with essentials! We really enjoyed our stay here. Great location, and a good view of the beach. It is stocked with so many amenities. I liked having a cloths drying rack, vacuum cleaner, fan, fishing poles, beach chairs, towels, and a great selection of kitchen appliances. The only thing that I needed was a full ironing board. We definitely will come back.